Glitter Daze - Flora Noxia Collection - Polish Etc. Do you love flakies? I love flakies! Everyone loves flakies. Especially the newest multichrome metallic flakies that are hitting the scene. 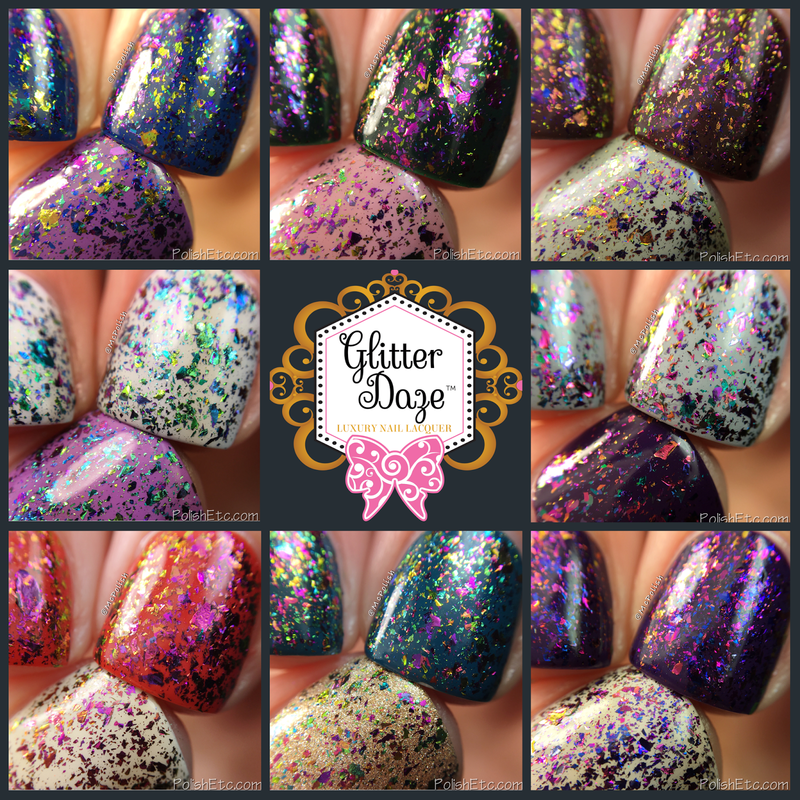 Glitter Daze is one of the indie brands that is know for amazing flakie toppers. Flora Noxia is a new collection this month that included two versions of each flakie topper, one with just the flakies and one with holographic microglitters mixed in. Today, I have all 8 of the plain flakie toppers to share. The polishes are all named after deadly plants because you will just die when you see them. Ha! Just a quick note about all of these swatches. I used one coat of the flakie topper over two different colored bases. I am showing you macros with both glossy top coat and matte top coat (Matte all the flakies!!). The matte top coat I used was Sally Hansen's Big Matte top coat and it really mattified/blurred the polishes. These flakies are all very thin and easy to apply. No sticking up at weird angles. Also, I used two light sources at different angles to really show off the shift of the flakies. Enough of the chatter....let's look at some flakies! Many photos after the break! "Phosphorescent Nightshade" is a mix of shifting flakies of pink, magenta, deep blue and purple which go more red/orange/gold at extreme angles. The general color effect is purple and magenta. I used one coat over Morgan Taylor Birthday Suit and Cirque Colors Velvet Underground. "Blooming Mortalis" is a mix of magenta, gold, green and indigo flakies that shift into more pastel versions of those colors at extreme angles. Overall, this topper has a pink and gold feel. I used one coat over Cirque Colors Jane on Jane St and Cirque Colors McKittrick. "Belladonna" is a mix of pinkie red, orange, purple and aqua flakies that shift more golden at extreme angles. The overall effect of this topper is pink and aqua. I used one coat over OPI Vant to Bite My Neck? and Glisten & Glow OG Snowman. "Fleur Fatale" is a mix of rainbow flakies. There is a good mix of all colors in this one and it is difficult to pick out one color that represents the entire polish. I used one coat over OPI Love. Angel. Music. Baby. and Mary Kay Tempting Teal. "Blood Flower" is a mix of magenta, red, orange and gold flakies that shift to gold/yellow/mint at extreme angles. This polish definitely gives off a red and pink vibe. I used one coat over Zoya Jacqueline and a red creme (sorry I don't remember which one I used). "Salvia Divinorum" is a mix of deep blue, light green and gold flakies that shift to pink/purple at extreme angles. This polish overall gives off a blue and yellow feel. I used one coat over Pahlish Whomping Willow and OPI Lost my Bikini in Molokini. "Delphinium" is a mix turquoise, blue, pink and gold that shifts to aqua and lavender at extreme angles. Overall, I get a an aqua feel. I used one coat over OPI My Boyfriend Scales Wall and Nails Inc Lexington Gardens. "Wisteria Venenosa" is a mix of indigo, bronze, green and pink that shifts to green and orange at extreme angles. The prominent color of this topper is green and gold. I used one coat over Zoya Misty and Zoya Louise. Lots of different colors and tons of flakies! Some of these look similar to eachother but they are all a little bit different. I would say my faves are Delphinium and Salvia Divinorum because I am more drawn to blue and teal flakies. I really like the delicate nature of these flakies and how easily they glide on. As I stated before, each of theses also comes with holo microglitters. They are each $12.50 from the Glitter Daze sight. As far as I know, these are not limited edition. So, which ones do you think you will pick up? Oh my flakie! So gorgeous.